Is Your Boring Regulatory Strategy Costing You Business? 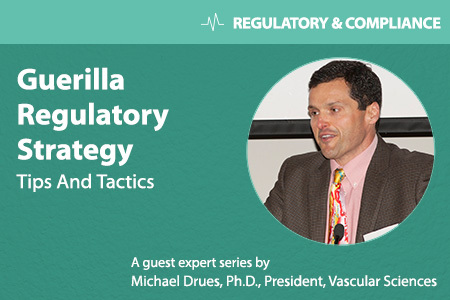 When people in the medical device world use the phrase “regulatory strategy,” they usually mean the path they will take to get their product onto the market. And when they say “competitive regulatory strategy,” they are usually referring to the way their competitor(s) got their products onto the market. In my opinion, there is little “strategy” involved in either of these ways of thinking. They represent nothing more than playing follow-the-leader. To me, regulatory strategy means so much more. Anybody can design a regulatory strategy to get a product through the FDA and onto the market. The challenge is designing a regulatory strategy that not only gets your product to the market, but also makes it more difficult for your competitors to follow in your footsteps — creating a barrier to the competition. Most organizations, in my experience, don’t even think about regulatory strategy in these terms. They view the regulatory process as nothing more than a burden or a series of hoops they have to jump through in order to get their product to market. I view it as an opportunity to position the hoops to make it more difficult for competitors to follow in your footsteps. Let’s look at a few hypothetical examples. Let’s say you are a manufacturer of a Class II medical device that has a long track record — it has been on the market for many years — and there are similar devices out there. You could easily go to FDA and make the case that because the product has been around for a long time and has a history of safety and efficacy, it should be down-classified to Class I. It’s the same “regulatory logic” as we use to “reclassify” a drug from prescription to over-the-counter. As a result, you would make your job easier when seeking FDA clearance for future generations of that particular product. On the other hand, you have also made things easier for your competition. If you are working in a large medical device company (i.e. you have a lot of money and other resources) and your competition is primarily small and startup companies (that don’t have a lot of resources), you might choose not to seek down-classification, not because you can’t successfully achieve it, but because you can use it as a barrier to entry for competition — or at the very least create a bump in the road for them. The same thinking applies to the FDA’s de novo pathway, which is essentially another form of down-classification. By default, new medical devices are automatically classified by FDA as Class III for no other reason than they are new. Congress created the de novo pathway to provide a more efficient means to bring new low-risk devices to market, avoiding the lengthy PMA (which is required for most Class III devices). A very simple example would be a band-aid. Today band-aids are ubiquitous but if you were bringing the first band-aid on to the market, FDA would consider it a Class III device, because no predicate exists. Yet, it doesn’t make any sense for a simple band-aid to be categorized as Class III. As the band-aid’s manufacturer, you could certainly argue that your product, given its low risk profile, should be Class I and eligible for the faster de novo process. This would be very tempting to do, because it would make your job a lot easier and get your product to market more quickly. However, it will also deliver the same benefits to your competition. So you might opt to split the difference and argue the new band-aid should be Class II. The third example is a little more sophisticated. While most medical devices are brought into the U.S. market through the 510(k) pathway, higher-risk devices require premarket approval (PMA), which is much more burdensome and time-consuming. There is an alternative process for high-risk devices, though, called the humanitarian device exemption, or HDE. HDE is intended for devices to be used for small patient populations (fewer than 4,000 individuals in the U.S. per year). It is effectively the equivalent the orphan drug program on the pharmaceutical side of the world. Sometimes we bring medical devices onto the market through the HDE pathway first, and then went on to do what amounts to a “label expansion” as a PMA, in order to obtain a much broader indication (i.e., go after a bigger market). The advantage to this approach is that there is no efficacy requirement for the HDE. Approval is simply based on “probable benefit,” so the bar is set much lower. I am not going to get into the details of what this approach entails here, but needless to say it is much easier to get a new medical device onto the market under the HDE (if you can qualify) and then do a label expansion later, as opposed to starting with the PMA. Should You Blaze A New Trail? Most manufacturers bringing medical devices and diagnostics follow the same process — the same path — as many have done before them, and that is certainly an option. If it’s to my advantage to follow in somebody else’s footsteps, I will by all means do so. And when I walk into a regulatory agency, I will point out in 72-point font on my PowerPoint slide that we are simply following what has been done before. End of discussion. Let’s go home. On the other hand, if following in somebody else’s footsteps does not work to your advantage, then you have to figure out how to make a path of your own. Because when you follow in somebody else’s footsteps, there’s one thing I can guarantee — you will never go anywhere new. You need to know when to follow, but more importantly you need to know when to lead. Truly competitive regulatory strategy takes more thinking than the follow-the-leader approach, but ultimately it can be well worth the investment from a business standpoint.